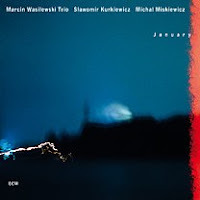 The Marcin Wasilewski Trio stepped into the spotlight last night at Birdland, celebrating their latest ECM release, January. Despite an uncharacteristically early start time by New Yorker standards (it’s hard to get us to show up for anything before 8:00, preferably 9:00), they played to a sizeable, enthusiastic crowd. Having heard them live and on disk quite a bit over the last week, it finally struck me they were getting a similar reaction that I have seen Jason Moran’s trio (a.k.a. Bandwagon) receive. It is not that they bear striking stylistic similarities, but they both have the same “in-it-together” ethos, with nobody on the bandstand looking to take a lot of bows at the expense of the group endeavor. Both trios also project an unaffected sense of cool, which is appealing as well. That unity of spirit in particular though, is something audiences for both trios really respond to. Logically, the set drew from January, including Tomasz Stanko’s “Balladyna,” with the trumpeter in attendance, fresh from yesterday’s concert at MoMA. Introducing the tune, Wasilewski recalled playing for Stanko at the same club a year and a half ago. In an interesting decision, the Trio concluded with Carla Bley’s “King Korn,” perhaps the thorniest, most demanding selection on the CD. In general though, the set was representative of the thoughtful intimacy that characterizes January. The Wasilewski Trio shares the enigmatic lyricism of their mentor. Listening to their music unfold is a pleasure. They are probably the most original and cohesive trio unit I have heard since Moran’s group came on the scene. Given jazz’s uncertain, usually prohibited status during the dark days of Communism, it is especially rewarding to see great new talent from Poland emerge on the world stage. From New York, their American tour continues on to Philly, Baltimore, Ann Arbor, and LA. Again, whether on CD or in live performance, they are definitely highly recommended listening.